Damn that was hard work. 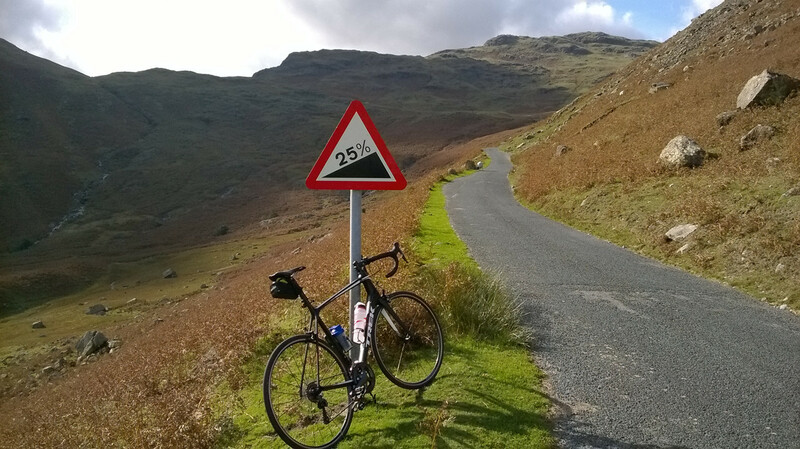 Eskdale to Ambleside and back. Wrynose on the way back was just relentless and into the wind. I cycled much of it overall but got off and pushed a few times cos I was either knackered and or had to stop for a car (or cattle) and couldn't get going again. Keeping the front wheel down and thinking I was going over backwards was one of the problems, kept popping little wheelies when I got going. And I had a stupid rucksack to keep my d lock and cable loop in. The descents were fun in a scary rollercoaster I don't want to die kinda way. About 5,000 ft of climbing in 36 miles. But, my friends own a cafe in Ambleside and I got a free lunch and met old friends I haven't seen for years. Oh and as today was Eskdale show, swarms of vintage motorcycles coming the other way which was great to see. Passed a few guys last week and looked at my Strava flyby to see where they were going as it was quite a remote section. Some Audax thing which is a name I have heard but never knew exactly what it was. Google it if you're interested.